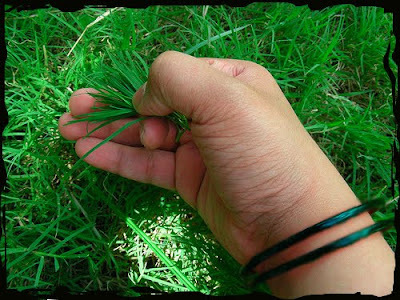 Durva(Agrostis linearis) is a special type of sacred grass. The word Durva is derived from the words duhu and avam. Duhuavam means that which is far away and means that which brings closer. Durva has greater capacity of attracting and constantly enhancing principles of three deities namely AadiShiv, AadiShakti and AadiGanesh. Generally tender shoots of durva are used in puja ritual of a deity. These tender shoots have highest capacity to absorb principles of deities present in the dew drops fallen on their leaves. This benefits the worshipper. If durva bear flowers, they are not used in puja ritual. Flowering plant denotes the ripeness. Ripening causes decrease in the vitality of the plant. This further reduces its capacity to attract the frequencies of deity principle. Once there was an Asura (demon) named Analasura. He was so terrible that the earth would tremble by his voice and his eyes used to emit fire. So everybody was very scared of him. Even the Gods were terrified. So all the gods prayed to Ganesha so he would rescue them from the clutches of Analasura. Ganesha became into a child and assured all the Gods that they would be saved from Analasura. Ganesha started “Sarvkasha” war. Analasura’s powerful eyes oozess out fireballs and destroyed surroundings of Ganesha. At the end Analasura tried to gulp Ganesha but Ganesha himself showed his “virat “ roop and gulp Analasura to destroy but due to increased heat in body Ganesha could not even lie down. He was restless. He applied sandal paste all over the body even though the body’s heat was unbearable. At this moment all Gods decided to make a foundation of the moon on his head and Ganesha is also known as “Bhalachandra. Lord Vishnu gave his lotus therefore Ganesha is also known as “Padmapani”. Lord Shankara removed a cobra from his neck and tied it to Ganesha’s hip. Lord Varuna, Rain God showered plenty of water, heat was not subsided. Some of sages who came there with bunch of 21 Durvas and put on his head and a miracle happened. Ganesha became all right. Ganesha uttered that most of the Gods tried to help but only ‘Durva’ a simple grass made my agony into normal. With this he announced that whoever with devotion offer me Durva would be pious and get Punya. Secondly it is said that there was a most beautiful Apsara who devotionally loved and prayed to get married with Ganesha. Ganesha also used to like her. But Parvati, Ghanesha’s mother cursed Apsara to become a simple grass form on the earth where nobody would look at her. But Durva begged for pardon and asked for ushaap. 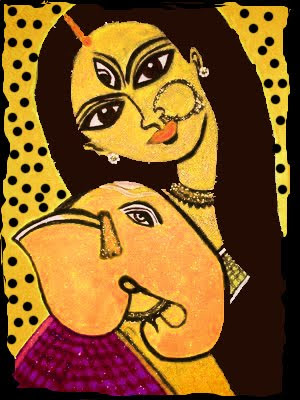 Parvati forgave her and told her that even though she is in the grass form she would be adored by Ganesha. Thirdly the story of Durva is as follow: Sage Kaundinya was telling the importance of Durva to his wife Ashraya. But Ashraya had a doubt about it. So sage Kaundinya gave a bunch of 21 Durva and told Ashraya to get the gold equivalent to Durva from Lord Indra who is God of all other Gods. She went to Lord Indra and asked about gold. Indra sent her to “Kubera” who is the treasurer of Gods. When Durva was weighing along with Gold more and more gold which resulted in a whole treasure was empty but could not be weighed to Durva. All the other Gods like Brahma, Vishnu, Mahesh arrived and sat along with Gold but weighing of Durva was more . Everybody was perplexed. When all Gods went to see sage Kaundinya at his ashrama and confessed the importance of Durva. Kaudinya said that Ganesha is king of all states and there is no one superior to him. 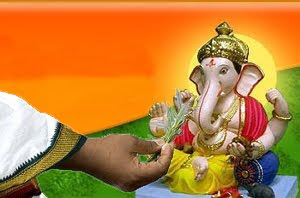 Offer the Durva with three or five leaflets to Sri Ganeshji. They are called durvankur. The middle leaflet of durvankur attracts the Principle of Primal Ganesh and the other two leaflets attract Primal Shiva and Primal Shakti Principles. The minimum number of Durva to be offered to Sri Ganesh ji should be 21. Tie the Durva together and offer them to Sri Ganesh ji after dipping into water. The entire idol of Sri Ganesh ji excluding the face should be covered with Durva. Thus the fragrance of Durva spreads around the idol. Sri Ganesh ji is ritualistically worshipped by offering a Durva with each chant of ‘i’ or with each utterance of the one thousand Names of Sri Ganesh ji. This is called ‘durvarchan’. In this the offering of Durva begins from the Holy Feet of iGanesh idol. The Principle of a Deity is emitted in higher proportion through the Holy Feet of the idol. So the Durva offered in the beginning attracts Ganesh Principle in higher proportion. This Principle is then transferred to the Durva offered later on. This Principle is spread up to the top by the Durva offered in sequence. Due to this the Chaitanya frequencies are emitted from the idol in higher proportion. As a result of the durvarchan done in this manner, the Ganesh Principle is attracted to the venue of the worship in higher proportion. The Nirgun frequencies of Principles of Deities are attracted in the idol. These frequencies are transformed into Sagun frequencies in Sri Ganesh idol and they are then emitted through the idol because of which the worshipper gets more benefit. It is thus clear that due to the emission of the Deity’s Principle through the Durva, the adverse influence of the raja-tama-predominant Principles in the environment is reduced. This is the reason why a person suffering from negative energies feels distressed when he comes in contact with the Durva. why 21 only ? whats a link behind 21? why not 11 or 31 ? Cynodon dyctilon is the correct grass variety to be offered to Lord Vigneswar instead of Agrostis linearis.